Fitch Ratings has upgraded the State Export-Import Bank of Ukraine's (Ukreximbank) $125 million 2023 subordinated loan participation notes (LPNs) issued by Biz Finance Plc to 'CCC' from 'CC' and removed them from Rating Watch Positive (RWP), Fitch has reported in its press release. 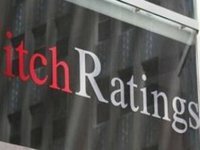 According to the document, the upgrade follows the publication of new Fitch's Bank Rating Criteria. The rating of other securities of the bank and the bank itself remained unchanged. Ukreximbank's $125 million LPNs were issued in 2006 and restructured in 2015. The issuer of LPNs is a UK-based special purpose company Biz Finance PLC. Under the new terms, principal repayments were rescheduled and extended to 2023 from 2016, and the coupon rate was raised to six-month LIBOR+7% from a fixed rate of 5.8%; the principal amount was not reduced. The bond documentation does not provide for coupon omission, principal suspension or write-down at the option of the issuer. The bank ranked third among 84 banks operating in the country as of January 1, 2018 in terms of assets (UAH 171.011 billion), according to the National Bank of Ukraine.